If you’ve fallen hard for a superthin notebook, you’re probably running into the same issues I am. Mine has a beautiful display and great battery life, but it has just two USB ports—only one of which is USB 3.0—and it doesn’t have a hardwired ethernet port. The transceiver for my wireless mouse and keyboard occupies one port, and a USB-to-ethernet dongle consumes the other. Unplug the dongle so I can connect a hard drive, and I lose my network connection. Unplug the transceiver and I lose my external mouse and keyboard. If you’re getting by with just a tablet, you’re probably having even more connectivity issues than I am, especially when it comes to driving an external display. So I decided to check out the $220 Targus Universal USB 3.0 DV Docking Station with Power. If Targus wants it back, it’ll have to pry it out of my cold, dead hands. This little device has become as essential to my day-to-day productivity as my coffee mug. I set the back of the computer on top of the dock, and its wedge shape lifts the computer off the surface of my desk, increasing airflow around it and keeping it cooler. A rubber strip running across the 10.63-inch width of the dock prevents the computer from sliding off. Targus uses an in-line power brick, so there’s no wall wart to hog space on your outlet strip. 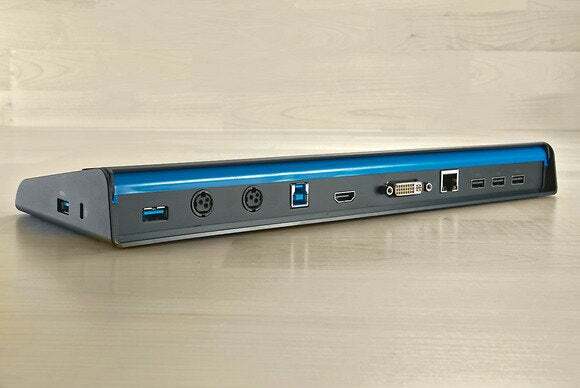 The dock takes up my notebook’s sole USB 3.0 port, but it provides two more plus four USB 2.0 ports (I increased that number to seven available USB 2.0 ports by connecting one of them to the four-port USB hub in my monitor). I tested the USB 3.0 port’s performance by transferring a 10GB collection of files and folders as well as a single 10GB file from a Toshiba Canvio Slim II portable USB 3.0 hard drive to my notebook’s SSD (a read test). I then repeated these steps in the other direction, copying them from the notebook's SSD to the portable hard drive (a write test). With two 24-inch displays also attached to the dock, the read tests occurred at 93.9 and 112.5MB/s, and the write tests were accomplished at 89.0 and 62.8MB/s (see the chart for details). And I saw no decrease in performance when I added a second USB 3.0 hard drive and performed the same tests with it at the same time. Two of the dock’s USB ports provide extra power to charge battery-powered devices, whether the computer is docked or not. Other ports on the dock include gigabit ethernet (solving my USB-to-ethernet dongle problem), and audio in and out (so I don’t have to unplug my headphones every time I take my laptop into a meeting). The dock is equipped with DisplayLink technology, so it can drive two outboard displays (there’s one DVI and one HDMI, but Targus provides DVI-to-HDMI and DVI-to-VGA adapters in the box). Resolution tops out at an odd 2049 by 1152 pixels per display, but it’s more than adequate to drive two 24-inch displays at 1920 by 1200 (or 1920 by 1080) pixels each. Targus tells me the dock can support even more monitors if you plug additional DisplayLink adapters into its USB 3.0 ports (the dock’s software supports a maximum of six external displays when connected to a PC running Windows). 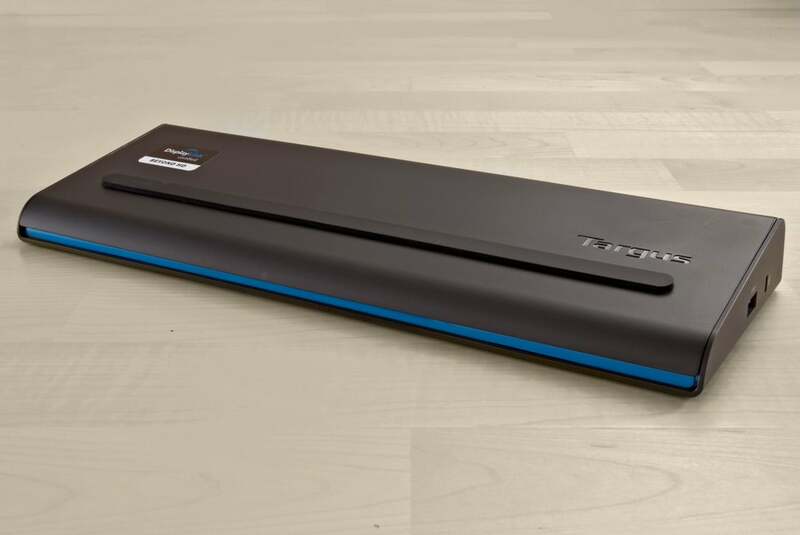 The “with power” element of the model name describes the dock’s ability to provide electrical power to a 19.5-volt DC laptop or Windows 8 tablet using a proprietary stub cable. Targus provides ten different tips for this cable, conveniently stashed in a cubby inside the dock, to meet the needs of common brands. Although the dock supports Mac OS X, Targus can’t provide tips for MacBooks because Apple won’t license its MagSafe power connector. Targus doesn’t provide tips for the iPad, either. Finally, the dock’s power supply currently doesn’t support 12-volt DC devices, such as some slates and tablets. I was surprised to discover that Targus doesn’t provide a tip for current-generation Lenovo notebooks, but Targus will provide buyers with whatever tip they need after the sale (the company says it periodically adjusts the collection of tips that it ships with the dock, and that the new Lenovo tips will be included soon). Having the dock power the notebook means that I can leave the notebook’s power supply in my bag, so I don’t have to remember to unplug and pack it every time I go on the road. If you can't use or just don't need the power feature, the Targus model ACP70USZ dock includes everything else, and it costs $50 less (based on MSRP). Two features would make the Targus ACP71USZ an even better universal docking station: a Thunderbolt connector and support for DisplayPort 1.2 with multistream transport. I can live without DisplayPort, since I don’t need to drive more than two external displays. but Thunderbolt would be nice to have. This universal docking station is just the ticket for notebooks and Windows 8 tablets that don't have dedicated docking ports.